Thank you for posting this, Wally. If you and any of your readers are free on Monday night, come on down to the Town Hall for what should be an interesting discussion. I hope Tom Chamberland will attend, even though this may be an "anonymous" invitation. And if there are veterans who supported removal and/or disposal of that monument, I hope they can make it down there, too. Wouldn't you think that those elected and appointed to work for the Town of Sturbridge would have been proud to keep the monument with the names of its WWII, Korea and Vietnam Veterans on the front lawn of the Town Hall? The monument was tastefully designed, and a meaningful enhancement to the area. Over $5 million spent for the renovation projects and they disposed of the monument? Something's not right here. Let's let them know that we want it returned. I would like to know what Tom Chamberland means by, "The stones from the monument are long gone." Gone where? Was the monument disintegrated into a pile of rubble? Or was it taken and reused elsewhere? If destroyed, where's that pile of rubble? Was it taken to the recycling center, or buried in a hole somewhere? Having purchased stones for landscaping purposes, I can you they are not cheap. Please tell us where the monument is "long gone" to. Great news! There was a friendly overflow crowd at the Selectmen's meeting tonight, in favor of having our outdoor monument returned. Several people spoke in our favor. Only 1 person spoke against it. We plan on using the original plaques which are presently hanging on the wall indoors. The selectmen voted 4 to 1 in our favor. Thank you, Wally for sharing your blog with us. Watched the meeting on TV last night, pros and cons were presented extremely well. Can help but wonder if there could be a compromise, I propose keeping the plaques with the names inside the Town Hall in Veterans Memorial Hall and putting up a monument in front of the Town Hall, perhaps with an inscription saying "In honor of all those who have served their country" and listing all of the wars or police actions. Seems to me this might satisfy all. Personally, I feel that the monument was taken without our prior knowledge, and that things should be put back the way they were. Being told that our monument "detracted from the look of the town hall," was very hurtful, and insulting to our veterans and their families. I would like to see us "made whole," in other words, just put back to square one, with the plaques we already own. Someone decided that they didn’t want the “distraction” of our veterans monument on the lawn of our town hall. Someone decided to “quietly” remove that monument. There was no mention prior to any vote by the public that the “plans” for the town hall/center school showed no veterans monument on the lawn of the town hall. Yes, “they” quietly decided to erase the monument from our lives. 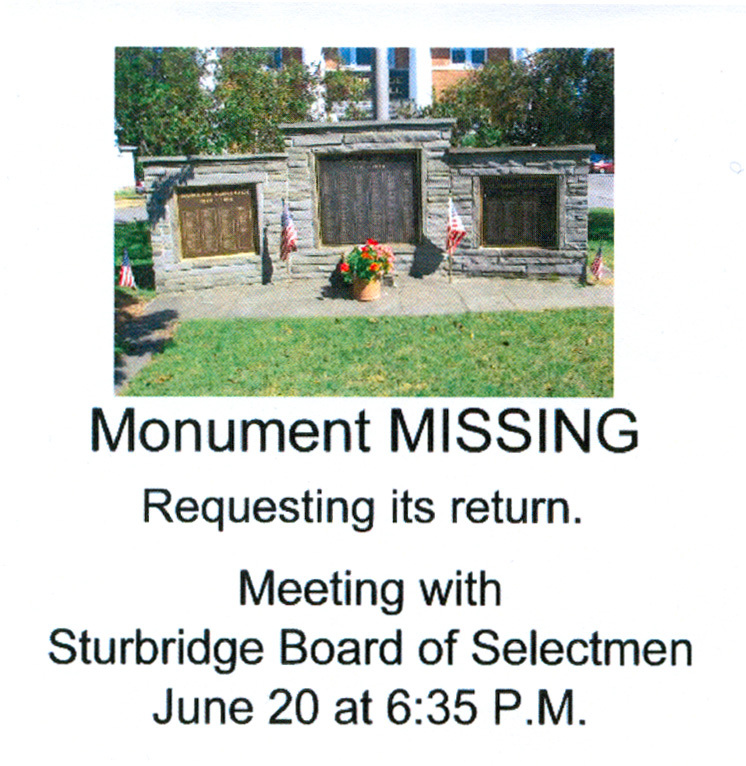 Last night, at the Selectmen’s meeting, Tom Chamberland, our Veteran’s Agent, called the veterans and their families and friends (an over-flow crowd) selfish for asking for the return of the monument. What’s wrong with this picture? When someone takes something precious of yours without permission, you shouldn't have to negotiate to get it back. I am a veteran and as a veteran I want to hang in the town hall beside my brothes who laid down thier lives.... This is sentimenal nonsense. the only reason those plagues were placed outside in the first place was because there was no room on the walls. Now they are in the right place.. I hope they do not raise enough money to put it back outside. And one more item. It seems to me that this change should have gone to town meeting... and not be left in the hands of the BOS. This space belongs to all persons of Sturbridge, not just to the people who came before the BOS. I would have spoke up, but the crowd was intimidating. I love my country and the veterans that fought and died. I did not stand up, because I would have been unfairly lable. The Veterans Memorial honoring those that gave their lives is located across the street in front of the Center School building, and will not be affected. This is for the Veterans Monument, or Honor Role, that will be replaced in front of the Town Hall. This is will be a public display of honor for our veterans, as it had been for many years.